Peppermint Oil For Hair Loss - 60% More Hair Growth Than Minoxidil! Peppermint Oil For Hair Loss – 60% More Hair Growth Than Minoxidil! As a hair loss treatment that’s similarly (if not more) effective than minoxidil, peppermint oil is a necessary addition to your hair care routine if you want to stop any further thinning and receding and perhaps even regrow your hair. In this guide, I’ll discuss the use of peppermint essential oil (PEO) for the treatment of hair loss. This will include an in-depth look at recent scientific research, as well as ways you can use the ingredient more effectively. Can PEO Be Used to Regrow Hair? Are There Risks or Side Effects Associated With Peppermint Oil? Peppermint is a plant hybrid of spearmint and watermint, and it’s used in a variety of industries. In addition to its place in the kitchen (where it’s added to tea, gum, ice cream, and more), it’s also been used quite recently for its many health benefits. 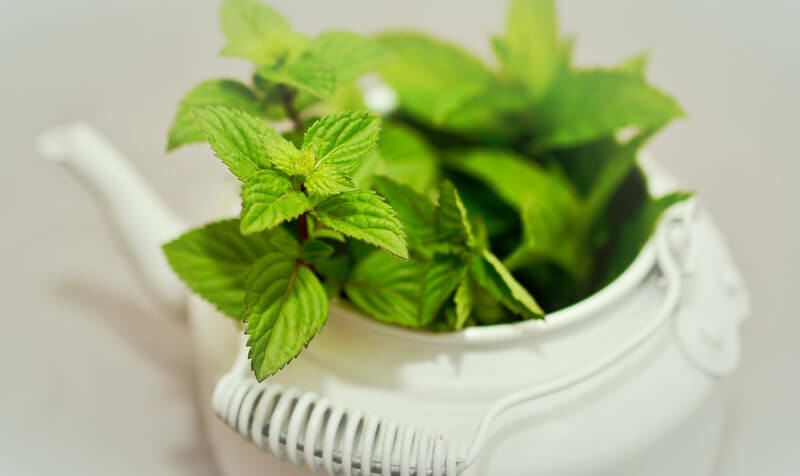 Peppermint has been shown to be effective in relieving hot flashes in women, reducing symptoms of irritable bowel syndrome, and decreasing nausea (1, 2). Due to its cooling effect, it’s used commonly in the temporary treatment of muscle and nerve pain, as well as in the relief of itching (3, 4). In addition, its aroma is frequently used to induce alertness. There’s no doubt that PEO is a highly versatile ingredient. But where does it stand when it comes to treating hereditary baldness? As will be discussed further below, PEO has a variety of properties that make it an excellent addition to anyone’s hair regrowth routine. In 2014, Korean researchers studied the effects of PEO on hair growth (5). Comparing the essential oil to Minoxidil, a popular FDA-approved hair loss treatment, the results were certainly stunning. 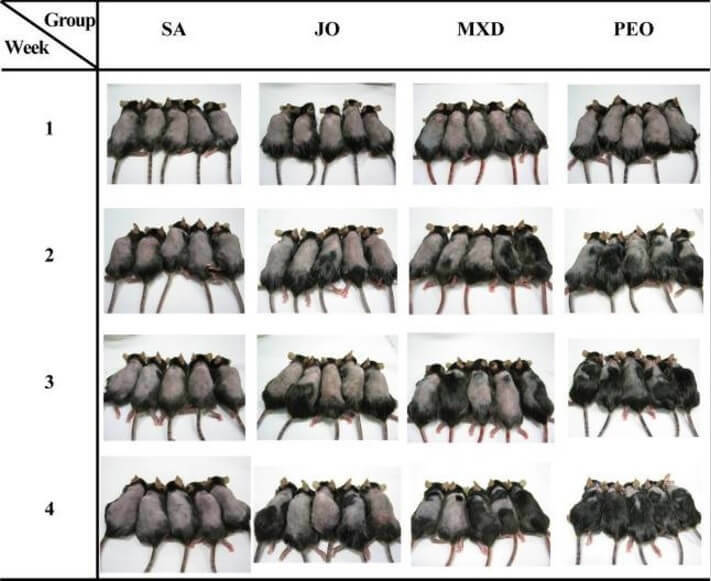 In the beginning of the study, 20 male mice were shaved on their dorsal area so as to standardize the telogen phase for all. The application was done six days per week for a total of four weeks. Throughout the study, photographs were taken to visually track hair growth. Each photograph was categorized, and the categories were as follows: 0: no hair growth; 1: less than 20% growth; 2: 20% to less than 40% growth; 3: 40% to less than 60% growth; 4: 60% to less than 80% growth; and 5: 80% to 100% growth. In addition, skin biopsies were taken at conclusion of the study, and a number of RESULTS were tested. As clearly depicted, saline and jojoba oil had minimal visible results throughout the course of the study. 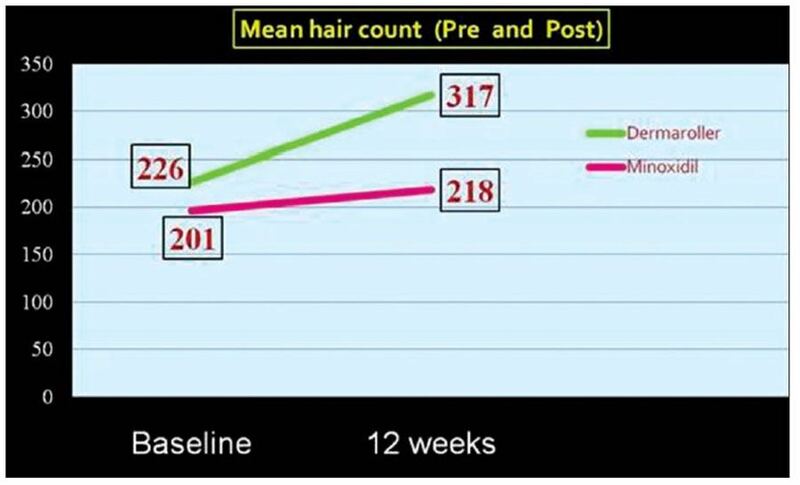 However, minoxidil and PEO saw positive hair growth from week 2, and this continued through the entire four weeks. Further, PEO was clearly dominant when compared with minoxidil and growth was still ongoing. This means that both groups of mice were in the anagen phase of hair growth even after four weeks. Now, while visual results can be helpful, let’s get a better understanding of the scientific results obtained by biopsies and samples. While PEO and MXD were close in the first week, PEO quickly took the lead in terms of hair regrowth scores. 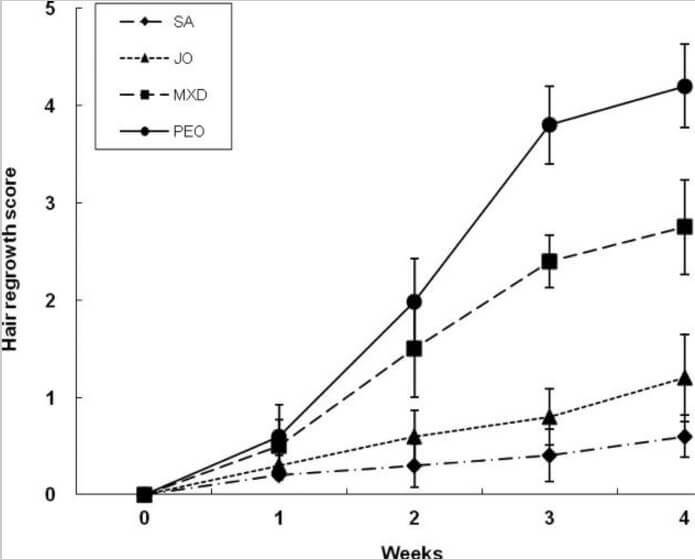 In fact, the gap between the two treatments only continued to widen as the weeks passed to reach 60% at the end of 4 weeks between PEO and MXD. Next, let’s look at the biopsy results. Here, we see the a vertical histological view depicting the quantity and quality of hair follicles. Only minoxidil and PEO showed clear hair growth, as depicted by the elongated hair follicles and hair shaft. Last, researchers compared the number of hair follicles in all four groups, as well as the depth of said follicles. By week 4, the PEO group had seven times and three times more hair follicles than the SA and JO groups, respectively. In addition to all of the above results, PEO was also shown to increase blood circulation to the scalp. This was determined by monitoring Alkaline Phosphatase (ALP) activity. When ALP activity is increased, the relaxation of vascular smooth muscle occurs. This enables improved blood flow, and enables your hair follicles to receive the nutrients and oxygen it needs to stay healthy. Peppermint oil can increase blood flow when applied topically. As such, it also increases the delivery of oxygen and nutrients. But what does this mean for hair loss sufferers? Oxygen, as it does in all other organs, plays a crucial role in the hair follicle. It not only keeps it alive, but it also provides the scalp with circumstances necessary to thrive. Let me explain. When testosterone is produced in the prostate, it doesn’t stay there. Instead, it travels to various parts of the body (including the scalp and hair follicles). This is known as Free Testosterone (fT) (6). When fT makes its way to the scalp, it meets another substance – 5AR (7). If the circumstances are right, as they often are, this interaction will result in the production of DHT. And while this is okay for individuals without Androgenetic Alopecia (AGA), it can lead to inflammation and miniaturization in those with the condition. But what exactly do I mean by circumstances being right. Well oxygen plays a role in the scalp’s environment. In short, a low-oxygen environment will contribute to the production of DHT. This is because very little oxygen is needed for the exchange. If you have AGA, this will only continue the cycle. 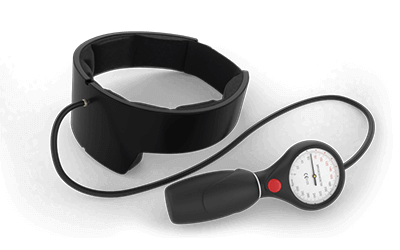 The presence of DHT = miniaturization = less blood flow and poor oxygen levels = hair loss. However, you can increase the oxygen levels (with natural extracts such as peppermint oil) to create a different outcome. This outcome, another by-product of fT and 5AR is estriadiol, an estrogen steroid hormone that’s actually been shown to induce hair growth (8). By increasing oxygen levels, then, you’ll see a decrease in DHT production and in increase in estradiol. While the above study was performed on mice, the results can have serious implications for the future treatment of hereditary baldness. How so? 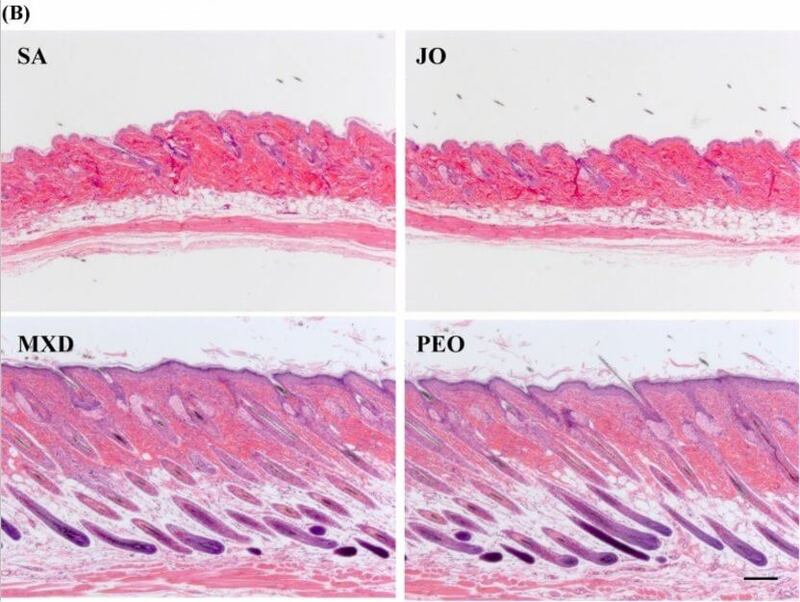 As shown, PEO plays a key role in the initiation of anagen phase and hair follicle proliferation. Both of these are necessary for the growth of healthy, strong hair. In addition, it also markedly increased IGF-1 gene expression at week two, where it took minoxidil until week four to do (9). What does this mean? The IGF-1 gene is one that promotes cell growth and survival, and also increases the thickness of hair. An increased expression of this gene means improved hair growth. 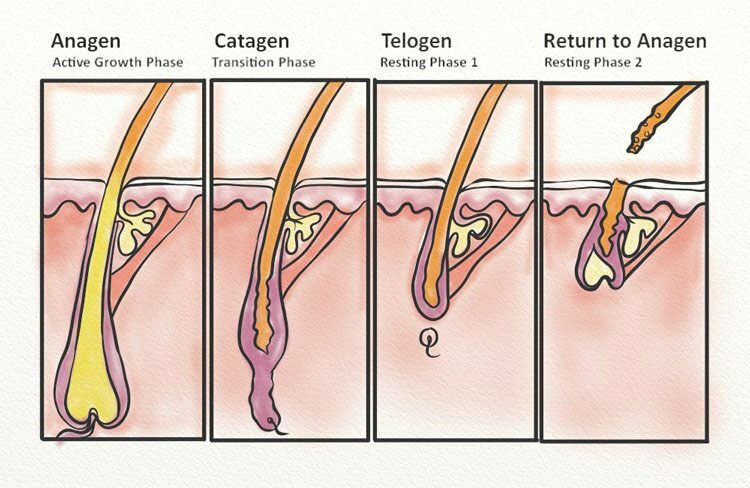 In individuals with AGA and other such forms of alopecia, this can mean that the use of PEO can “reboot” the hair growth cycle. The above study does show some promising results, but PEO is beneficial to thin and receding hair sufferers in a number of others ways, too. First and foremost, this nice smelling herb belongs to the same family as rosemary. This is another oil that is beneficial in the treatment for regrowing hair, and this connection may indicate more positive benefits for PEO than just what the above study shows. In addition, PEO has benefits that aren’t just related to scalp health. However, these benefits can still provide your scalp and hair with positive effects. 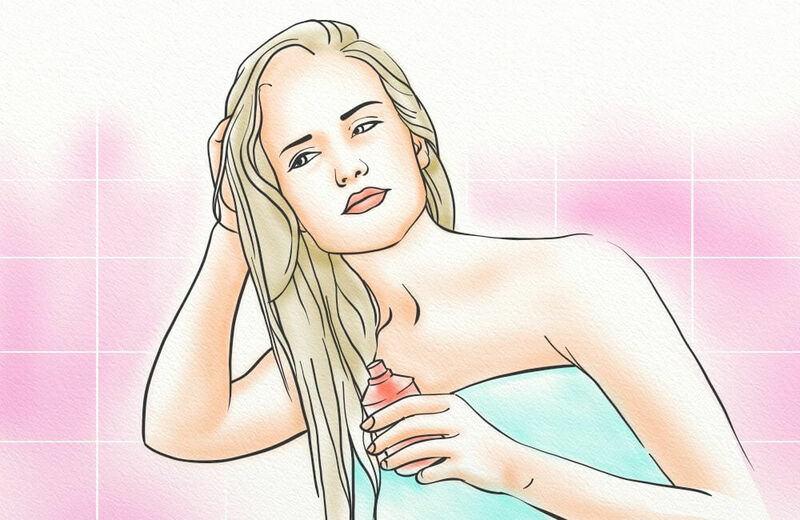 Scalp buildup – including sebum, sweat, dead skin, hair product, and even chemicals such as DHT – can create an unhealthy environment for your hair. This can lead to irritation and inflammation, and it can also encourage the growth of bacterial and fungal infections. PEO is an effective antimicrobial, fighting both bacteria and fungi (10). This was proven in a 1996 study that tested the efficacy of ten different essential oils against 22 bacteria and 12 fungi. 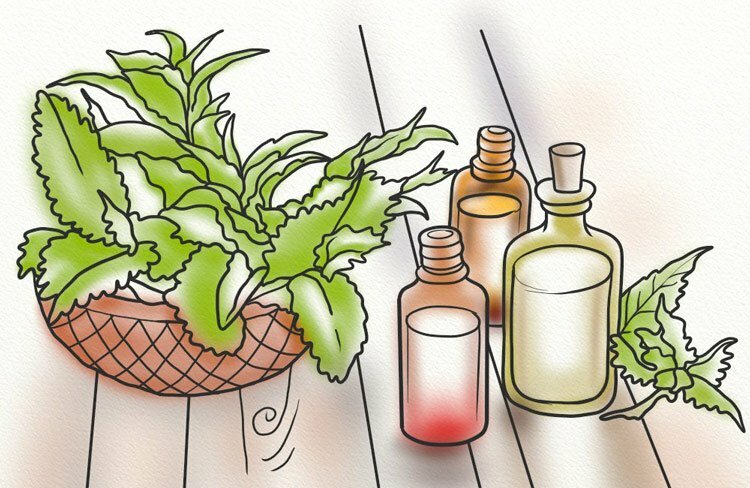 The oils included in the study were aegle, ageratum, citronella, eucalyptus, geranium, lemongrass, orange, palmarosa, patchouli, and peppermint. The oils were introduced to the various bacterial and fungal cultures, and here’s how peppermint oil fared. Peppermint was effective in inhibiting all 22 of the bacterial strains, as well as eleven out of twelve of the fungal strains. Whether you suffer from tinea capitis, dandruff or seborrheic dermatitis, or folliculitis, PEO can cleanse the scalp and treat the issue at its source. This means you can provide a clean and healthy environment for your hair follicles, and this in itself is a necessary step when looking to regrow your hair. 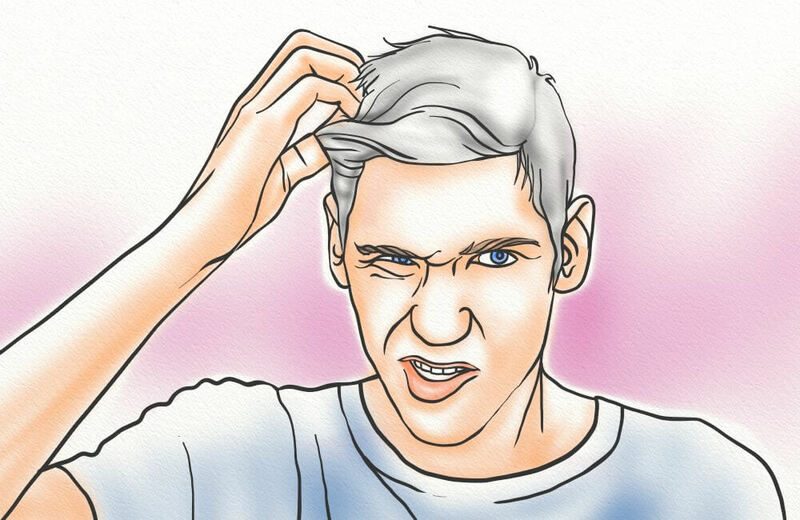 The conditions mentioned above – such as dandruff and folliculitis – can cause irritation and inflammation. Not only is this uncomfortable, but it can also lead to inflammation, scarring, and permanent bald spots. 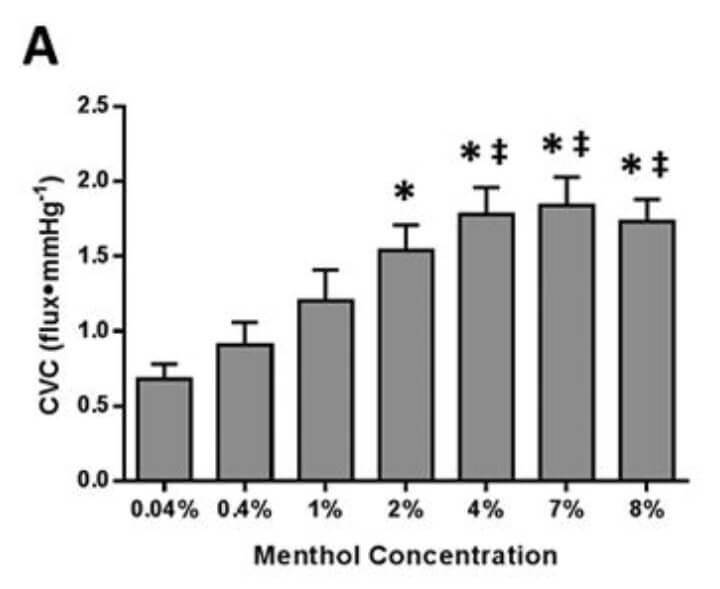 PEO’s main component, menthol, is a known anti-inflammatory. This was shown to be true in a 2016 research study, which aimed to determine whether menthol could be used to 1) treat a parasitic infection; and 2) soothe the symptoms of said infection (which include inflammation of the skin) (11). Praziquantel (a drug commonly used in the treatment of the infection). NOTE: The menthol in this study was derived from a pharmaceutical source – Mentaliv, which is commonly used to treat Irritable Bowel Syndrome (IBS) – and it wasn’t the only component within the Mentha 15 and Mentha 60 treatment groups. Another major component was methone, which was up to 32% of the solution. 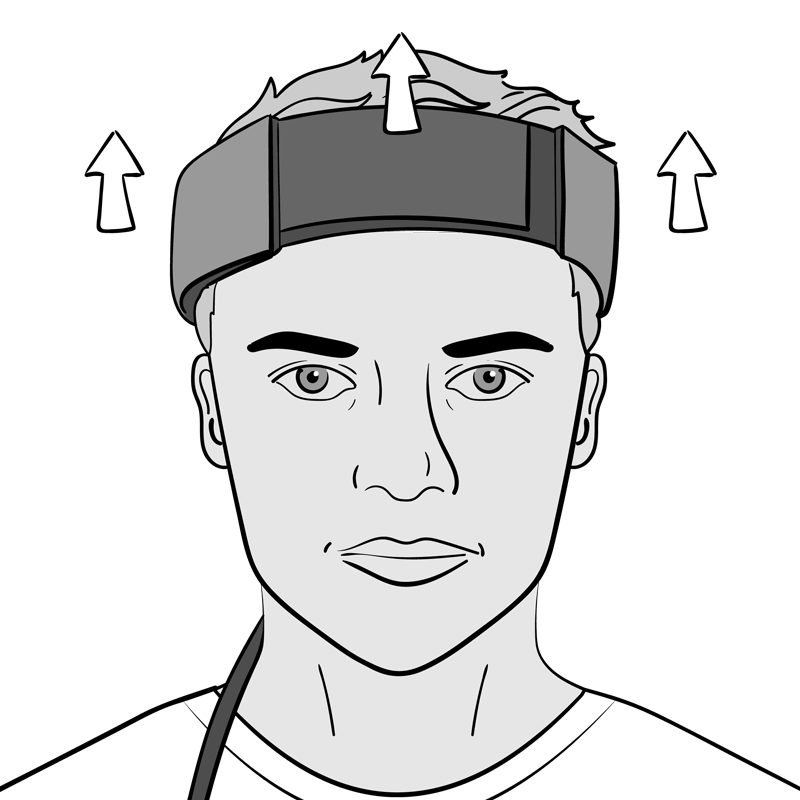 As seen above, the Mentha 60 experimental group gave the best results when compared with the positive control. In fact, IL-4 levels were reduced by 53.5% in comparison to the positive control, and IL-10 levels were reduced by 62%. This anti-inflammatory property was also confirmed in a 2001 study when PEO reduced allergen-induced histamine release (13). Histamine is the chief cause of allergy and inflammation in our body. What does this mean for hair loss sufferers, and menthol’s effect on the scalp? This oil’s anti-inflammatory properties, then, may be able to effectively soothe an irritated scalp and prevent further irritation and inflammation from reoccurring. As mentioned in the 2014 study entitled “Peppermint Oil Promotes Hair Growth without Toxic Signs”, PEO promotes blood flow. This was seen by monitoring ALP activity. But what exactly does this mean for hair loss? The main cause of hair loss in men and women with AGA is the presence of DHT in the follicles. This leads to a process known as miniaturization, which causes inflammation and irritation. When this occurs, another side effect also sets in – a reduction of blood flow to the area. This happens because the hair bulb – the base of the follicle and the source of nutrients – is separated from the blood vessels due to the swelling. The follicle is then unable to receive adequate oxygen and nutrients, both of which are necessary for healthy hair growth. This means that applying PEO to the scalp can naturally reduce inflammation while also increasing blood supply. The best (and safest) way to use peppermint oil in the treatment of thinning hair is in shampoos and scalp elixirs. As an essential oil, PEO should be thoroughly diluted before it’s applied to the skin. This will greatly reduce the risk of skin irritation, while also ensuring that the peppermint oil is more effectively delivered to the hair follicles. However, properly diluting PEO can be difficult without the right equipment. This is why we recommend you purchase a pre-made formula, such as the HairGuard Scalp Elixir. PEO should not be used if you have any liver or bile-related diseases (gallstones or bile duct obstruction). Also, its safety in pregnant women has not been tested. While itching, redness, and hives may reduce over time (though, you should keep a close eye on these symptoms, too), you should seek out emergency medical help if you experience any of the other symptoms. The dermaroller is a microneedling tool that inflicts tiny wounds onto the scalp. These wounds are deep enough to stimulate new cell production and boost blood circulation, but cause no pain (15). I’ve used the dermaroller with great success, and I recommend that you combine this technique with a hair growth boosting ingredient, such as PEO. This will improve the absorption of the oil and, therefore, boost the results. IMPORTANT! Be sure you leave at least 12 hours between microneedling and applying the oil – otherwise it will sting really badly! Source. Dramatically increased hair count after 12 weeks of using the dermaroller compared to minoxidil alone. And when we consider that PEO is more effective than minoxidil, it becomes clear that PEO + dermaroller would be a powerful combination. You can see a professional to have this treatment done. However, it’s also possible to do it on your own. Apply the right amount of pressure. You want to apply enough pressure so the needles penetrate the skin to the dermal layer, but you don’t want to cause pain or excess bleeding. Press just until you feel a slight tingling. Use a multi-directional method. 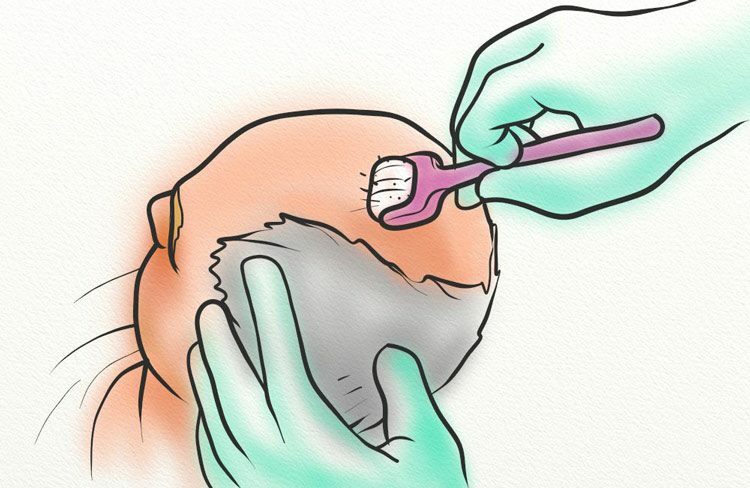 For best results, you want to cover as much of your scalp as possible. This is why it’s recommend to use a multi-directional method, including vertical, horizontal, and diagonal. Wash and sanitize after each use. Allow the dermaroller to sit in an antibacterial wash for at least one minute after each use. Then, rinse, dry, and put away in a clean container. Doing this each and every time will reduce the chances of an infection. NOTE: The dermaroller should be used prior to application of the oil, but allow the scalp to rest for at least 12 hours before applying the oil. While this may seem like a long time, the effects of microneedling are present even days after the procedure. As a common plant, the oil is widely available and very affordable. This oil can be purchased in grocery stores, health food stores, and even chemists. In addition, you can purchase the oil online from a wide variety of retailers, including Amazon. If you’re in need of a soothing, cleansing, all-natural product, then peppermint oil may be just what you’re looking for. This is because not only is it seemingly effective at treating hairfall caused by AGA, but it may also treat and prevent thin-hair-causing infections and conditions (such as seborrheic dermatitis) and reduce inflammation. Of course, peppermint oil should not be considered a cure. But it doesn’t hurt to give it a shot, especially in conjunction with microneedling. I’ve never heard of using Peppermint Oil. Is this something I can put in before bed and wash out in the morning? Hi Justen. Yes probably your best option is to add 15ml of peppermint oil to 200ml of magnesium oil (you can also add rosemary oil if you want) and then massage a small amount into the thinning/receding area of your scalp before going to bed. You’ll then have to rinse it out in the morning otherwise your hair will look greasy but that’s the most simple and effective way to use it. Great information ok so too early to tell i do not have full blown MPB i have thinning and a not so bald spot on the scalp, i used lots of fat burners ephedrine base and stims to lose weight so that is partially due to this. I bough peppermint oil apply twice per day with jojoba oil, also leave in conditioner herb, magnesium oil and i am waiting for melatonin oil. I also take saw palmetto and pumpkin seed oil, i tried dutastiride and minoxidil with terrible side effects, gained lots of weight water etc,,, i also use DIM this time around for estrogen control so far so good no weight gain. Hi Yannick, I hope it goes well with your mixture. But remember, any topical treatment will have only a limited effectiveness. To truly reverse MPB over the long term you will need other approaches such as diet and lifestyle changes, otherwise you will continually be fighting a losing battle. I thoroughly enjoy using peppermint oil on my scalp, I do this daily and my hair has grown much thicker and there is more of it. It smells nice and fresh and would recommend it to anyone who’s having hair loss problems. Hey do you reckon I could mix peppermint oil in with an organic shampoo base and make my own mix – leave it on for about 10 minutes? Was also thinking of adding caffiene powder to the shampoo. Yes you certainly could. But make sure whatever shampoo base you use, it needs to be very gentle if you plan to leave it on for 10 minutes. The last thing you want to do is strip away too many of the protective oils from the scalp using a harsh cleansing agent. I personally just use apple cider vinegar once per week to wash my hair. I use PEO along with magnesium oil in a scalp spray. Thank you Will, this is a really good article and I like how you’ve used scientific studies to backup your claims. It is quite encouraging that PEO beats minoxidil. And much less side-effects I’m sure. Thanks for your comment Jason. Yes I’d much rather use PEO over minoxidil even if they were equally as effective. Given PEO is actually better, now there’s 0 reason to use Rogaine anymore. I have already used Minoxidil 10%for 1 and half years but It has not worked for me ,so i quit using it as i end up losing more hair and got much more dandruff on scalp. so can i use peppermint oil alone everyday for treating MBP ? I’m diagnosed with seborrheic dermatitis too. You can start to use the three techniques you mentioned at the same time. We recommend you dermaroll once per week, massage daily for 10 – 15 minutes, and shampoo just 2 – 3 times per week. I’m 45 years old and started thinning and balding 3 years ago. My main concern with minoxidil is that after using it the hair can’t grow by itself anymore. Does this solution have the same or similar side effects? Thank you for your anwser and the time you put into creating this blog! Hi Izabela, yes after using and then discontinuing minoxidil people often experience shedding where hairs that have been saved or regrown due to the minoxidil fall out and you’re back to where you would have been if you’d never used it at all. I am not sure but I would presume something similar would happen with PEO. Luckily however, there is something you can do to stop this happening, and that is to change your body internally so that any new hairs grown will stay there. This is why diet is so important. Because if you don’t change your diet you’ll always be fighting a losing battle with any new hairs grown from topical applications like minoxidil or PEO. As a quick example, perhaps you do an allergy test and find out that gluten is causing you problems and causing inflammation which then leads to hair loss. You remove gluten from your diet and get rid of the inflammation. Then new hairs grown with topical applications will be much less likely to fall out after discontinuing the treatment. You’re just using the topical treatment to stimulate new growth, but to keep it there you need to change your body chemistry internally. Is it true that you cannot use any oils on your skin when you are on oxygen. Is that true. I’m not really sure what you mean? I have made my own mixture that I have started using in my hair after I shower. It isn’t greasy at all and the smell dissipates after it dries. In a small bottle I put half water and the other half ACV then a few drops of peppermint oil and a few drops of Lavender oil as well as one drop of tea oil. Basically the ACV mixture cleans my scalp and the oils increase blood flow to my hair follicles. Simple, cheap, and I believe effective. Love to hear what you think? I like the recipe. 100% natural and each ingredient has its place. Consider adding rosemary oil for its ability to inhibit 5AR. Actually, I did but I forgot to mention it. Appreciate your help. Hi, How long should the needles be of the dermaroller? Does your program equilibrium contains GRO2? Do you have an email? Hi Eddy, the dermaroller in the primary study that we quote use 1.5mm needles. However this is on the longer side of our preferences. I now recommend using a 1mm dermastamp. From 0.5mm to 1.5mm will have an effect so it’s basically personal preference between those sizes. Hair Equilibrium is a digital product, so nothing is shipped. However it does include recipes for your own hair growth elixirs. I do have an email but I prefer to respond to questions on the blog, since then everyone can benefit from the discussion. Hi I’m using PEO mixed with Aloe Vera. It definitely feels good in my hair but I am shedding lots. These hairs are thin and dry. I had been on Minoxidil 2 years back which left alot of my hair in the telogen stage, that is dry, thin and different colour. Do you think the PEO is responsible for this shedding? I can easily pull out some now. Hi Dave, it’s hard to say what has caused the shedding. I would make sure the concentration of PEO isn’t too high. perhaps 5% PEO and the rest could be aloe vera if you choose that. Have you stopped using minoxidil? This could cause the shedding. Hi Adnan, yes it would be absolutely fine to use rosemary essential oil instead of a bunch of rosemary – and much more convenient. You could, but it can make it look unclean. So you probably wouldn’t want to unless you didn’t have to go out. 12h to wait after dermaroller? So should we use some kind of oil immediately after dermaroller or just leave it? It’s up to you. There are a few good options. But you have to be careful, some lotions will sting a lot if you put them on straight away after using a dermaroller. Emu oil is a good option though. I got my peppermint and magesium oils a few days ago and put them together but when looking into the bottle it seems as if the two oils dont mix, but stay as two different layers. Should it be like that? I shake the bottle before spritzing it on my hair for now. Hi Tadija, yes you’re right, the two are immiscible. That’s why you must make sure you shake it thoroughly before spraying. There are ingredients that can be added to make them mix completely and stay mixed, but since we don’t want to be adding additional ingredients that don’t promote hair growth, and could potentially cause harm, we decided to leave them out of our formula. After all, shaking the bottle a few times before spraying is easy enough. Hey just wondering if peppermint oil mixed with coconut oil would be fine or if magnesium oil is the best to mix with. Also, how long should the mixture stay on your scalp for? Does it have to be overnight? Hi John, in general the longer the ingredients are in contact with the scalp, the better. Coconut oil can be good, but it’s easy to overuse and then just make the hair oily. It can also have quite a strong smell, if you are planning on using it overnight. Thanks for the reply – I’m curious why other than a potential lack of magnesium in diets do you recommend magensium oil as a carrier. Are the listed oils all safe for everyday use? I’m looking for a non greasy oil – Is magnesium a good choice/are all the listed carrier oils as effective? Also, the study say PMO 3% – what is the 3% referring to? Hi Jhon, magnesium oil works particularly effectively transdermally, and since it is applied to the scalp, right where we want to reduce calcification this does help to reduce calcification more effectively than supplementation alone. Yes they are safe for everyday use. Mag oil is not really greasy at all actually. It only has a slight oily texture, but in reality it’s not really an ‘oil’ at all. There are some other carrier oils that could be reasonable replacements, but we have found mag oil to be the best. The 3% is referring to the concentration by volume of PMO in the solution. Hi Harpreet, you don’t have to use a dermaroller, but it does help. Keep in mind though that topical treatments have limited effectiveness. You need to get to the real root cause of your hair loss, most likely your diet and scalp tension. I have just started to apply a mixture of peppermint , magnesium and rosemary oil. It’s only been 10 days now and feels good. I was recommended by one of my friend to use castor oil. Can I mix castor oil in my mixture or apply before bath? Or will it be any helpful. Hi Brian, you could try mixing in castor oil, but it will get sticky and messy quite easily. I probably wouldn’t, but if you want to try it once or twice and see how it feels then that is probably worthwhile. You can learn more about castor oil here. A great site! Thanks for helping so many of us. My question is with regards to peppermint oil. I have read in various articles that peppermint oil is a vasoconstrictor! It is used as a mild anesthetiser! Will it not mean that it will cause blood vessels to narrow and cause more hair loss? You’re right that a few studies have indicated peppermint oil as a vasoconstrictor. However, the main component of peppermint oil, menthol, is a known and well-studied vasodilator. Menthol can make up a significant amount of PEO, upwards of 40%, which is why the oil is known for its vasodilating effects when applied to the skin. hi i heard that a lot of these oils that battle hairloss also can have negative side effects like losing you’re libido permanently sometimes . i read that about saw palmetto and . is that the same with peppermint oil? these stories are also the reason i am reluctant to buy you’re product because it has those oils in it. i would love the stop my balding but if the chance of those negative side effects are true then i don’t know if its worth it. It depends which oils we are talking about. Often supplements that help with baldness work by blocking DHT, this could also affect your libido. But peppermint doesn’t work this way, it doesn’t block DHT so I doubt this would be one of the side-effects. Basically the only side-effect we hear about with PEO is light itching. Topical treatments are also much less likely to have side effects than ones that are taken internally such as saw palmetto and pumpkin seed oil. Can I use Rogain & peppermint oil both? You can use them together, though Will strongly recommends weaning yourself from Rogaine over time (while continuing with the natural oils). You should also use them at least 6 hours apart (for example, use Rogaine in the morning and the oil mixture at night). A good rule of thumb is 90% carrier oil (such as jojoba or magnesium), 6% peppermint oil, and 4% rosemary oil). When we apply oil on the scalp, will it clog the pores ? must i wash the hair after 1-2 hours applying the essential oil ? Do you sell the pre-mix ? There are certain oils that can clog the pores, but the ones we recommend do not. With essential oils (such as peppermint), you must combine with another (such as magnesium). You can leave it on overnight, and then rinse in the morning (with water). Hi. I have done something really wrong: I used an increased quantity of peppermint oil combined with the magnesium oil and I now have a urination problem. Is there anything I can do? It’s very unlikely that the increased amount of peppermint oil has caused the problem. I would highly recommend seeking help from your doctor. If I were to mix peppermint oil and rosemary oil into a store-bought shampoo, how much of each would you mix in? Thanks! I know Will would strongly recommend you combine peppermint oil (6%) and rosemary oil (4%) with mineral oil (90%) instead. You can certainly add those oils to store-bought shampoos if you like (in those ratios), though we can’t be sure it’ll have much effect. Store-bought shampoos aren’t good for applying oils, as they don’t truly penetrate the scalp. I was wondering how many times a week I should use PEO + plus other oils like castor oil (with the dermaroller procedure) to increase my hair growth? The dermaroller shouldn’t be used more than twice per week (preferably 6 days between sessions), and peppermint oil shouldn’t be used immediately after a session. You can apply a mixture of magnesium oil (90%), peppermint oil (6%), and rosemary oil (4%) each night. However, you should wait at least 6 hours after dermarolling to apply it. Hi Jesse, we have an article about onion remedies here. You can apply each night, and then rinse off in the morning with water only. How’s it going Will nice article. I started my hair journey again about 2 months ago with minoxidil (foam) and derma roller, little hairs have grew on my temples, I believe the derma roller plays a big part. However, minoxidil always leaves my hair kind of white every time I finish shampooing even after I apply by itself in the morning, it’s still residue just building up from it I’m guessing. In my household we always have plenty of natural oils and I always use it on edges/sides burns and it regrew my edges. The other day (Sunday) I wanted to test something new I decided to mix Castor oil, jojoba oil and peppermint oil and apply it to my edges for some reason more hair grew quickly and little hairs just came out of nowhere. To be honest I want to ditch minoxidil and start using oils only with dermaroller. If I leave minoxidil and start using the natural way will I lose anything I gain from minoxidil? And do you think I should just make that choice and stick to that peppermint oil mixture? 1. Wean yourself off of the minoxidil. For example, begin to use it every other day, and then after two weeks every second day, etc. 2. Begin to use the natural peppermint oil mixture while you’re still using minoxidil. We recommend applying the minoxidil in the morning, and the natural mixture at night. Hello Saransh, no! You need to dilute it with a carrier oil before applying it. It is too concentrated to be applied directly. Thanks for all the great information. I have severe FPB. I have been applying a mixture of castor oil, jojoba oil, peppermint oil, rosemary oil, lavender oil, chamomile oil, and cedarwood oil. Sometimes I leave it on for a few hours or overnight. How long / often do you think I have to do this before I see results? I’m really desperate to see results. Also, I know that you mention changing diet and lifestyle…. do you have any particular recommendations for a diet that helps to fight FPB? The length of time it will take to see results will vary by individual, however topicals alone aren’t enough. I recommend you check out Will’s Scalp Secrets guide for a more effective approach to hair regrowth. Should I wash my hair regularly if I apply peppermint oil+jojoba oil to my hair?Can I leave it on my scalp and wash after 2-3days? Also can I apply peo+jojiba oil to my scalp everday and wash after 2-3days? Yes, it’s alright to leave it in for several days and wash it out on the second or third way. I recently purchased the grogenix scalp elixir. I am a 22 year old man and I bought the elixir for my hairline. I have a full head of thick hair but it is just my hairline that is somewhat receding. Can this scalp elixir help with possibly regrowing and fixing my hairline? I also use a 100% natural shampoo and conditioner that is suppose to help with stimulating hair growth. Once that tuns out I think I will get the shampoo from your website in hopes that it will help with my hairline. Yes, the Elixir can be used on just the hairline, or all over the scalp. Is thinning and receding hairline in teenage years common? Can it be helped? Great post. Just one doubt. I already have a mixture of almond, olive and jojoba oil in a separate mix. Is it okay to add PEO to that mixture. If so what should be the proportion of these two in the mixture? Yes it sounds fine. Although I have never personally tried that mixture myself, so I don’t know for sure. The PEO should not be more than 5-10% concentration. Essential oils need to be diluted down by carrier oils. Aside from this I would definately recommend trying our Scalp Elixir formula. This is something we’ve been working on for a long time and is a proven formulation which gets results and is natural. This is great information. I’ve been using the peppermint the last couple of weeks. My question is, however, is this regrowth permanent, or if you stop using the peppermint does the hair that was regrown, fall out like the minoxidil/Rogaine? Hello Mar, any kind of topical treatment will not be permanent unless the underlying causes are fixed. Losing hair is an internal issue of body chemistry. Fixing this should be your priority. Once that is fixed, through nutrition and lifestyle changes for example then the regrowth your experience will be more permanent. If you don’t fix it then you’ll be fighting a losing battle. This is why for anyone who buys our Scalp Elixir we also strongly recommend fixing the internal issues at the same time to make the results better and longer lasting. What is your opinion on using a high-frequency wand for hair regrowth along with oils, massages, diet, etc? Hi Cody, are you talking about an LLLT device? If so, yes I do think LLLT can help a small amount. It certainly won’t hurt. You might want to check out the Grogenix Laser Cap. I have been mixing 1 drop of peppermint oil with a spoon of Sesame oil, is it effective?Its been 2 weeks and i am not able to find a positive result. Hi Alvin, honestly you’re not going to get positive results in two weeks. That’s completely unrealistic. You should also know that topical products aren’t really super effective. You will need to combine them with other treatments if you really want them to be effective. Yes, I would like to know the answer to that question also. Hey there, can I use it for my beard growth? Hello Mohamed, I think it would be better than nothing, however if that is your only approach then I wouldn’t expect much of a good result. You’ll get limited results from a topical and even less so by using it just twice per week. Hi Will, Thanks for your quick response. Would you suggest magnesium oil+PEO spray everyday? Will that be helpful. I am VERY grateful for this website your created, Will. You are helping me to prevent and revert my MPB. I didnt want to use Finasteride or Minoxidil because of the side effects, so I kind of given up on my hair for a while until I found your website. And, to my surprise, the tips you give here really work! Thank you a lot man. Seriously. You are helping me so much! Please talk about Coconut Oil. It works very effectively but I dont see post around here about it. Hello Vitor, thanks for the support. I am glad that it’s going well for you. Honestly it’s not easy and most people give up on their natural regrowth journey so props to you for sticking with it and getting results. I totally agree about finasteride and minoxidil. Not worth it! We have an article on coconut oil here. With 1 tsp Jamaican Black Castor oil how much PEO need to add? I want to mix this for my beard growth. And can I mix PEO with Jamaican Black Castor oil + Almond oil + Eucalyptus oil + Rosemary oil together for beard and hair growth? Hi Ryan, this article might be of use to you. https://www.hairguard.com/hair-loss-on-one-side-of-head. As for the mixture you tried, your skin might be sensitive. It’s always a good idea to do a skin test before using on a larger area. You may need to dilute the mixture since all shop bought concentrations vary. Certainly I wouldn’t keep putting it on if it causes irritation each time. If the hairs were shaved on the mice, you would expect some hair to regrow after a few weeks. Why then in the saline group is there no hair regrowth at all? Weeks 1 + 4 look basically the same. There should have been some regrowth during that period.